Check out this gently-used 2017 Porsche 718 Cayman we recently got in. This Porsche includes: LUGGAGE NET IN PASSENGER FOOTWELL SPORT CHRONO PACKAGE RACING YELLOW SPORT TAILPIPES IN BLACK SMOKING PACKAGE WHEELS PAINTED IN BLACK SATIN WHEELS: 20" CARRERA Tires - Front Performance Aluminum Wheels Tires - Rear Performance PORSCHE ACTIVE SUSPENSION MANAGEMENT (PASM) SPORT Active Suspension 2-WAY SPORT SEATS PLUS Power Passenger Seat Power Driver Seat Bucket Seats *Note - For third party subscriptions or services, please contact the dealer for more information. * How to protect your purchase? CARFAX BuyBack Guarantee got you covered. This Porsche 718 Cayman S's level of quality is not meant for just anyone. It's meant for the person who strives for a classy, comfortable, and luxurious car. In addition to being well-cared for, this Porsche 718 Cayman has very low mileage making it a rare find. 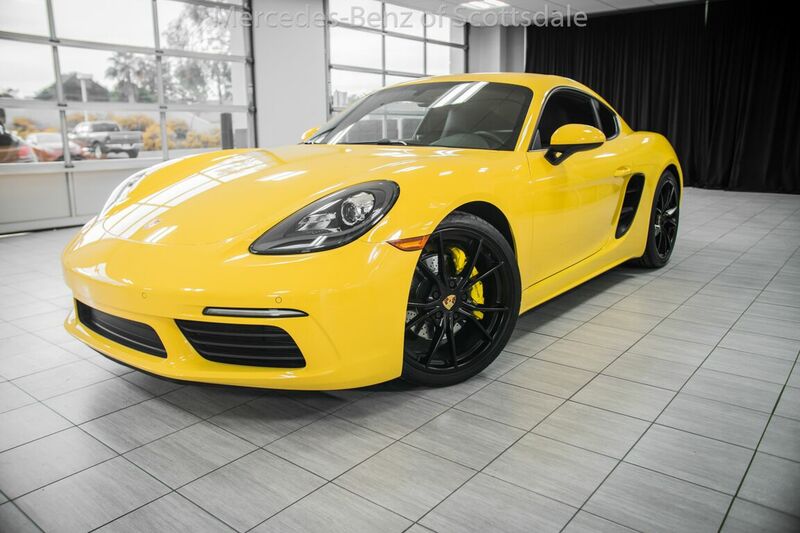 Marked by excellent quality and features with unmistakable refined leather interior that added value and class to the Porsche 718 Cayman This 2017 Porsche 718 Cayman S is proudly offered by Mercedes-Benz of Scottsdale Only the CARFAX Buyback Guarantee can offer you the comfort of knowing you made the right purchase. You deserve a vehicle designed for higher expectations. This Porsche 718 Cayman delivers with a luxurious, well-appointed interior and world-class engineering. Gently driven doesn't even begin to explain how lovingly cared for this ultra-low mileage vehicle has been. Based on the superb condition of this vehicle, along with the options and color, this Porsche 718 Cayman S is sure to sell fast.